Shopswell is an application that supposedly can help you find “cool products.” This tool promises to warn you about price reductions and save your time looking for good deals. In order to be applicable to all offers, you are asked to register using Facebook, Twitter, or your email. If you sign up using your email, you will automatically be signing up for price-tracking email notifications. Although the services provided by Playswell, Inc. might seem beneficial and attractive, there are several reasons why we advise removing Shopswell from your operating system. For one, this is an advertising-supported program, which means that it can expose you to suspicious ads by injecting them into the web pages that you visit. Although this is something you will expect if you want to receive the allegedly beneficial deals, you need to be careful when interacting with commercial offers. According to the official information presented at shopswell.com, ads are not included in the services of the suspicious program. Well, the pop-up messages with different deals and offers that show up on your desktop are considered advertisements, which is why we classify this program as ad-supported. If you sign up for the services promoted on the official website, it is possible that irritating offers will not show up. However, if you install this adware onto your Windows operating system, you can expect ads to show up as soon as the installation is complete. An official installer does not exist; however, it was found that this adware could be distributed using OpenCandy downloaders. For example, you could find it attached to the Youtube Downloader Guru program by SuZhou MorningSun Information Technology LLC. If you find this adware bundled with malicious infections, you MUST remove them right away. Once installed onto a computer, Shopswell is controlled using a process called “swell.exe”. Since this ad-supported program is not installed as a browser extension – which is how many ad-supported programs are presented – it is not surprising that a background process is employed instead. You can terminate this process via the Task Manager, but that will not remove the adware itself. Registry entries are added to make this program start running when Windows start. According to our research, several registries are added to different locations, and at least one of them has a random name, which might create difficulties when identifying and deleting Shopswell. If you are interested in which registry entries require removal, check the list added to the removal guide below. Shopswell creates shortcuts on the Desktop and Taskbar to its own website, which is why we are sure that this program is directly linked to the services on this site. Then why is the installer of this adware handled by parties that might introduce malware along with it? Fortunately, the removal of this program is not very complicated, and you should have no issues when deleting it from your Windows operating system. You might have more issues with the removal of third-party malware or potentially unwanted programs that are likely to come packaged with it. Note that even if the software installed together with this adware looks beneficial, it might be malware in disguise. Install a malware scanner you can trust to help you identify which programs are authentic and which ones require removal. 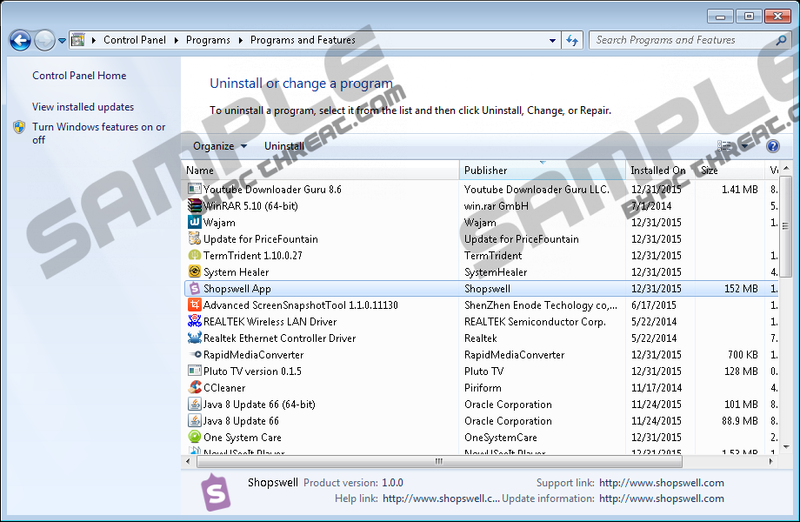 Shopswell App is the name of the uninstall entry that you will find in the “Uninstall a program” or “Add or Remove Programs” lists that you can access via the Control Panel. If you follow the removal guide below (option 2), you will learn how to uninstall this undesirable adware from your PC. Needless to say, this option is much easier than the first one, and we are sure that most users will choose it over the first one. The first removal option explains how to terminate unwanted processes, remove malicious files, and delete registry entries. Make sure you perform every single step carefully because mistakes can be detrimental. If you have questions about the process or any of the removal steps, please post a comment below, and we will respond as soon as we can. Tap Ctrl+Shift+Esc to launch Task Manager. Click the Processes tab and terminate the process, swell.exe. Type C:\Program Files (x86) into the address bar. Right-click and Delete the Shopswell folder. Enter C:\Users\user\AppData\Local into the address bar. Tap Win+R to launch RUN and enter regedit. Right-click and Delete Shopswell App. Open the Start menu from the Task Bar and open Control Panel. In the Programs menu click Uninstall a program. Quick & tested solution for Shopswell removal.